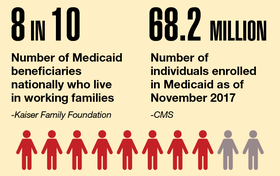 Data Points: Who is impacted by Medicaid work requirements? Data Points for February 5, 2018. Later this year, Kentucky could become the first state to enforce work requirements for Medicaid beneficiaries. The CMS approved the state's waiver in January, but it is being challenged in court by groups representing Medicaid enrollees. Another nine states have waivers pending with the CMS, which in late January issued new guidance for states seeking to add work requirements for able-bodied beneficiaries. Here's a look at who could be affected. Download the PDF.